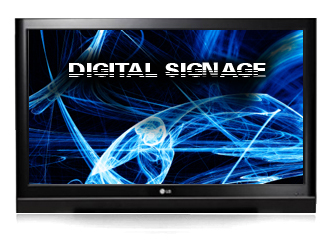 Digital signage is a new and effective type of sign that displays messages either on LCD or plasma screen. Instead of printing a single sign, a sequence of signs are displayed. Not only that, but you can display animation of movie clips! The digital nature and movement of the signage draws attention and is proven more effective than traditional signs. With the cost decrease of LCD and plasma screens, digital signs are now much more affordable to businesses and other organizations. EZ-DigiSign has also developed technology that leverages the Internet to eliminate the expense of developing and maintaining computer networks. Further saving is found with the EZ-DigiSign subscription service which eliminates the need to pay for multiple software licenses required to set-up digital signage with multiple players. EZ-DigiSign is browser-based, which means there�s no extra software to install, no special equipement to buy. Just a computer, a screen, and an internet connection. You can change your sign from your home, work, or across the world! Just log-in from wherever you are, make your changes, and your DigiSign will update automatically. Because there is no special equipment to buy, EZ-Digisign is inexpensive digital sign solution. With the EZ-DigiSign technology, extensive networks and complicated software installations are a thing of the past. EZ-DigiSign subscription to online software to maintain the sign from anywhere in the world. Digital signage can be used in many ways. 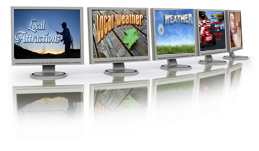 The two most common uses for digital signage are advertising and information distribution. With digital signage, businesses advertise exactly when customers are ready to buy. Known as "just-in-time" advertising, it is proven to increase sales of products advertised on digital signage. Building brand recognition is another key benefit of digital sign advertisement. Because digital signage attracts and keeps attention, consumers are more likely to remember the products advertised. Other organizations conveniently provide information for a variety of reasons. For example, during conventions digital signage located near entrances are used to give directions and to post urgent notices. Digital signage provides information and decreases the perceived wait times when people are required to stand in long lines or are delayed in waiting rooms. Digital signage also is used to display event calendars, special announcements and other information in break rooms and common areas of schools, government offices or office buildings.